So! I’ve not posted in a while, and as of 2015, that’s going to change! First of all, I’d like to wish you all a Merry Christmas, and I hope you are all enjoying what you got and the time you spent with your family. I’m revisiting a series by an author/artist friend of mine and wanted to let you all know about it! Especially since it’s for kids as well as adults 😀 I know this, because I myself have read them, enjoyed them and hunger for them so much that I’m posting this to badger her to speed up muahahaha! *Gryfon is the way Jess spells the name. She’s got an absolutely awesome mind, hasn’t she? 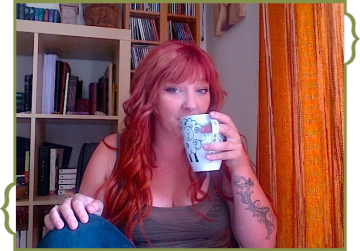 I’m gonna link to her books and hopefully – one of you (at least) will buy them and leave her a review! She’s got book three coming soon (not soon enough!) and you’ll want to be on top for reading it! Believe me, I am! Twisted Liminality – upcoming series! I thought I’d share with you the titles of my upcoming series. I’m currently partly through book five of six – which means then that they will be sent to my publisher. As and when I get covers for them – I’ll show them off 😀 what I wanted was to explain today about my series title, as most people won’t understand the why for it. The theme in every book has been that something is wrong. That there is a ‘poison’ within the world. Tattered, Twisted, Twined, Tainted and Torn (so far). Liminality means the following…’In anthropology, liminality (from the Latin word līmen, meaning “a threshold”) is the quality of ambiguity or disorientation that occurs in the middle stage of rituals, when participants no longer hold their pre-ritual status but have not yet begun the transition to the status they will hold when the ritual is complete. During a ritual’s liminal stage, participants “stand at the threshold” between their previous way of structuring their identity, time, or community, and a new way, which the ritual establishes. This fits in, as the lyk’osk’in in my series are reaching a point where change needs to happen. This change is going to have many changes in this world. Changes that I’ll possibly explore in further books around these animals and the humans they live with. I’ll be expecting myself to work on at least 3-6 more books, featuring both characters from the previous books and new ones. I’m still not entirely sure on who will survive in the final book. It’s all up in the air so far! 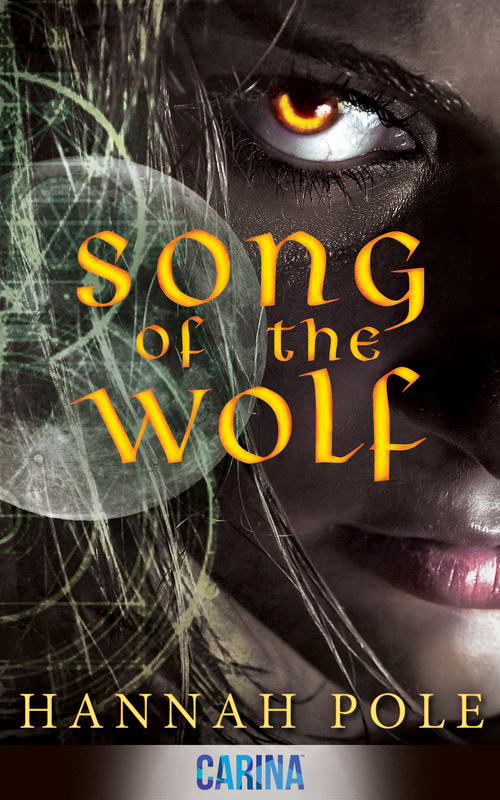 Hannah Poole Song of the Wolf Spotlight!!! Here is a link to the Song of the Wolf promo video! Yay! In the depths of England, a Kingdom lurks beneath the confines of normality. A hierarchy of supernaturals run by the strict council fight daily to keep their world a secret from the humans that appear to rule the world. With the Councils structure changing and the Kingdom struggling to keep up, the rest of the community must keep their heads down and do their duty. Or face the ultimate penalty. Shifters and Vampires have the hardest task of them all, fighting in the war against the Circle, a deadly band of rebels, practicing blood magic and capturing souls in their wake. With the new high lord in control, life has never been more dangerous. It is the second book in the Call of the Wilderness series, though you don’t necessarily need to read them in order! I decided that the entry was so funny; it needed to be shared with the world! So I started writing, and attempted to turn it into a novel. Though to this day, that novel remains unfinished, it will always be the novel that got me started, and showed me what I was passionate about. Honestly? I have aspired to be everything from a Private Investigator to a Zoo Keeper with my career; my interests change so quickly that I could never stick with one! Writing gives me the freedom to choose; I can be a cold-hearted assassin in love with a poet one day and the secret lesbian lover of a politician the next! While most stories begin in the darkness, ours begins in the light of day. Our first target for this story, a slender feral wolf, long-limbed but still small for her size, with wise golden eyes lingering in a face highlighted with silver white. Our second, a black German shepherd with eyes more gold than brown, stepping into the trees for the first time in his rather young life. With neither large built, though the dog held faint promise of being terrifying with a broad chest and noble, slanted head. The she-wolf, at the start of the days sleeps alone, devoid of her pack. The reason for it isn’t seen, though it’s clear from the shine to her silky coat to her sleek muscles that stretched like a sheath across her body. For now though, she sleeps, golden eyes shielded from the light as she breathed heavily and slowly. She was relaxed, only the faintest hint of movement making her toes twitch and her massive paws pedal the air as she dreams. We aren’t to know what she dreams about at this moment, only that the slightest hint of a whine, drifting from her muzzle and disappearing into the air that draws the shepherd to her side…though he is not the first. Indeed, he runs through trails, as hyperactive as any dog let off the leash and given the freedom to roam. Everything he can smell, he does. Everything he can mark as his, he does in his misguided sense of possession. But he’s not completely alone. The pack that have made this place their home run with him, unseen in the trees and silent as they run paths they know better than the prey they hunt. They don’t lift their voices in a call for a hunt, lacking their guiding light- the she-wolf who with her white coat leads their charge and makes their decisions for them. 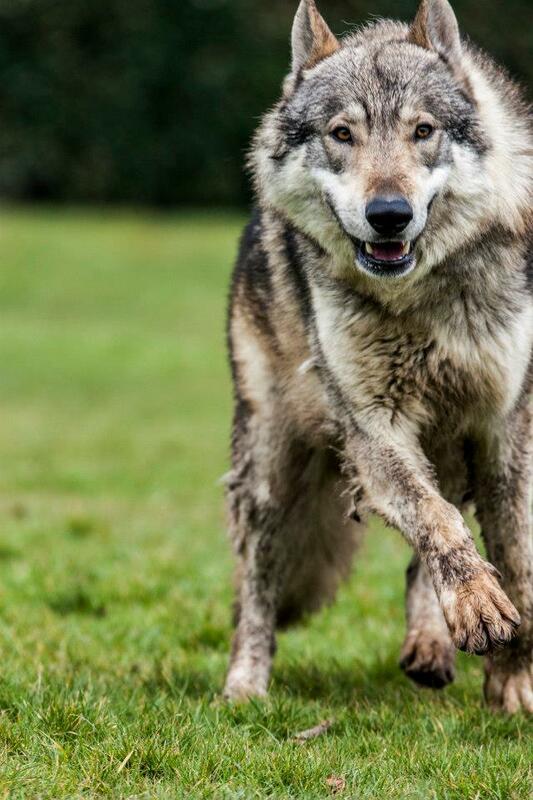 Grey-coated individuals split off, wheeling towards the back of his trail and cover his betraying scent with their own, reaffirming that they own this place to any that may try and take their boundaries from them. Softly, they break off, having done their job and disappeared into the distance while they await the ringing cry that will draw them back to the star in their silent sky. Instead, it is the dog that stumbles across her when drawn by tiredness, his youthful energy depleted in his urge to drink. His nose twitched before flaring, his sore paws stilling slightly before his head lifted and he let out a soft whine. There was water ahead, plenty of it and it was so fresh that he was lost to the scent. His paws pounded on the ground, beating fast as he raced headlong into the clearing where the river and the she-wolf sit. Her body is unseen in his run; his muzzle plunged into water as he drank thirstily. His pink tongue is dampened by the water, curling it into his muzzle as he sated the thirst that had had him panting. Only once his thirst is quenched, as surely as a fire is put out by a bucket of water, did his head raise and his odd eyes fix on the dreaming white wolf and her soft whimpers as she dreamed. Like any dog, he didn’t realise she was a wolf, plunging through the water noisily and then shaking so the water splattered her. Her whines stopped abruptly, her fur shifting all over her body before she leaped to all fours. Her hackles were lifted, from neck to hip and her teeth flashed in the light as a snarl forced its way from her throat into the space between them. He slid to a stop, cringing to the ground as the animalistic sound echoed in his mind, drawing to something inside him that screamed of the danger a wolf could wreak on a dog. Nothing in him even allowed for an attack on her. Instead, he turned to the side on stiffened legs and presented her with the slab of his shoulder. Not even a growl prickled at his chest, which in turn eased the sounds slipping from the wolf’s chest into silence. And silence was what reigned, for minutes until the she-wolf broke it. “What the hell do you think you were doing, rushing towards me and waking me up?! I could have ripped your throat out…or called to my brothers and sisters so they could have protected me.” Her voice was low and silky, though the threat was implicit in her words. The dog himself was stunned, sinking onto his muscled haunches before he shook his head in disbelief. “What the…how…how do you speak dog?” His voice was disbelieving, his head tilting to the side as he let out an inquiring whine. She snorted softly, rolling her eyes before shaking her head in disbelief and glaring at him. “We speak the same language, you idiot of a dog! Your sorry kind descended from the nobility of my own!” He words were forced out of stiff lips as she remained on edge, stiffened and on the verge of growling. A shake was all that he did before his nose flared slightly, and his ears perked upright. With such a start, was it any wonder that the pair became firm friends…and then, when time came, her mate, and fellow alpha? She didn’t take long to change; now her new mate had met the pack and her stomach was swelling. Despite his ‘dog’ title, he wasn’t seen as being out of place. It took them a while to teach him how to hunt, but as she slowed down, he only grew stronger. 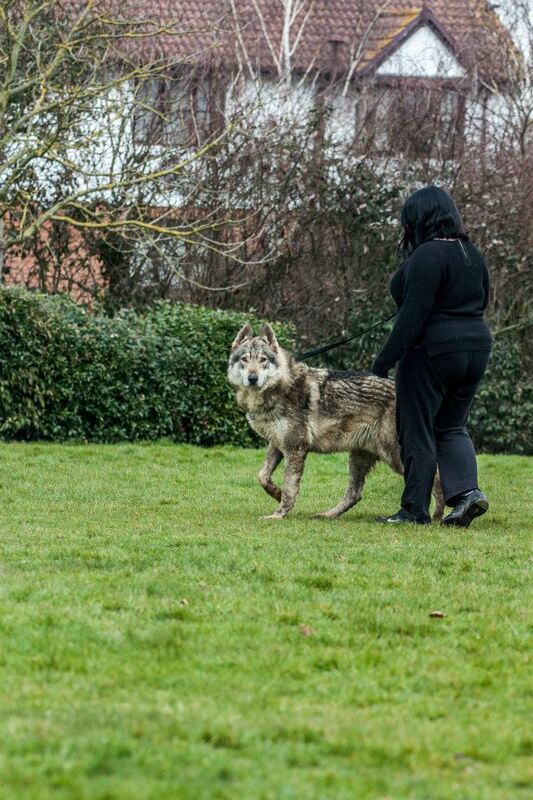 Their bond was intense, the affection they felt clear among the wolves…and even more intent when he lost his collar the day that she went into labour. It was that day that his yelps and whines drew the pack as he guarded the den from them, despite the jealous snarls coming from below and the occasional squeaking shape. 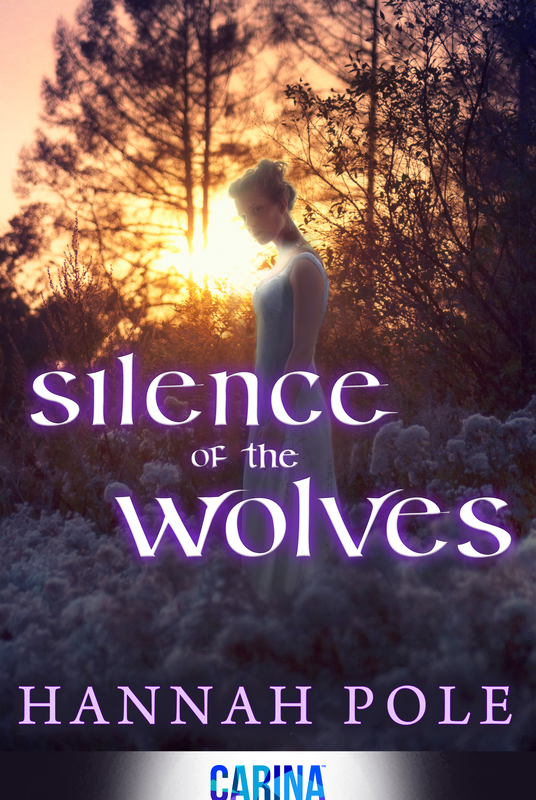 Three days and three nights she was down there, so long that silence reigned in the clearing and the pack worried until they were anxious and pacing. That was when the gaunt face of their beloved alpha, mate…sister, slipped from the darkness and drank thirstily in the lake. One by one, they were led down to look at the pups, a black cast to their coats and slightly larger ears the only difference to the fat pups, erupting into squeaking balls of fury as their mother laid down and curled her large body around them. The black shepherd curled at the entrance, his muzzle just pressed in through the entrance so their voices could meet in quiet conversation. He was guarding them, jealously providing his back to prevent any harm from coming to the pups and his mate. The pack fed them all, hunting taking places endlessly as the wolf fed herself up in preparation for the pups wanting more milk as they grew ever bigger and took their fathers build for their own…for that was clear. They were already deeper chested with narrower paws than most wolf pups were at birth, but with bald tails and ears, they were almost indistinguishable from others of their blood-kin. Our journey started as a school project back in 2009. Charlie was given the task of writing, editing, and publishing a book. He was always writing stories and the teachers had a difficult time getting him to do his homework or doing the writing topics they wanted him to write on. Since then we have tried our hand at finding an agent with the big publishing companies before going the indie route. We had found someone to help us edit the book but they didn’t quite have the same vision for the story as we did. We had also found someone to help us create a book cover but again, they didn’t quite see it as we did. 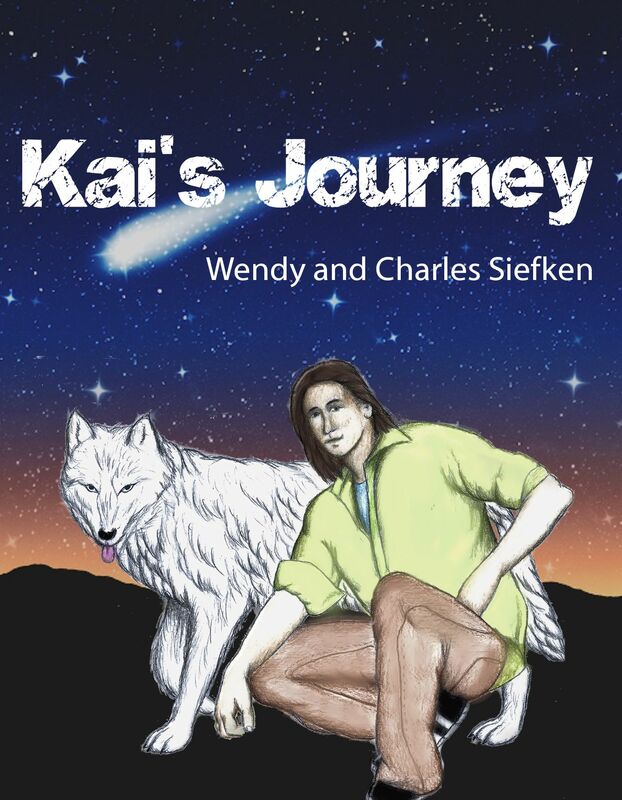 Since we have joined with MasterKoda Select Publishing we have had wonderful help with editing the book to make it the best story possible with characters that will stay with you long after you finish the book. Dan Peyton who is a very talented author is also a gifted artist who helped us by drawing the characters Kai and Clover for the cover. His amazing talents and beautiful work can be seen on the cover along with Rebbekah White’s background that helps bring the story to life. Together these two wonderful people have created a beautiful work of art that we are proud to display for our book cover. But it was this lad, Rain, who came out to see me first. He is massive! I mean…truly huge. 8 stone (52kg/115lbs) in weight and taller than I was. His paws? Larger than my own hands. And yet, he had the sweetest personality. 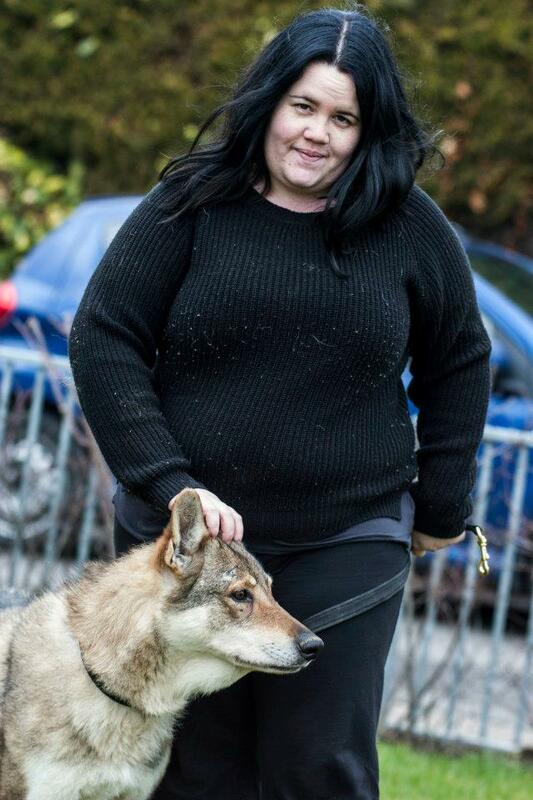 I wasn’t just able to stroke this handsome, handsome lad…I was allowed to walk him too! He wasn’t as much of a puller as I was expecting, less so than my malamute! However…he did pull when we reached the field I was walking him through..
Wonder what he saw here? Could it be the camera? Or the idea to pull me about…? You can see the size of his paws here…and those AWESOME eyes. A mixture of burnt amber and orange, they were absolutely piercing…and 1000000% better than I believed they could be. Apparently, I hadn’t let him say hello quick enough…so before I knew it, he was in my face…and I couldn’t get my arms around him! He was kissing me for ages…and yes, I nearly fell over! 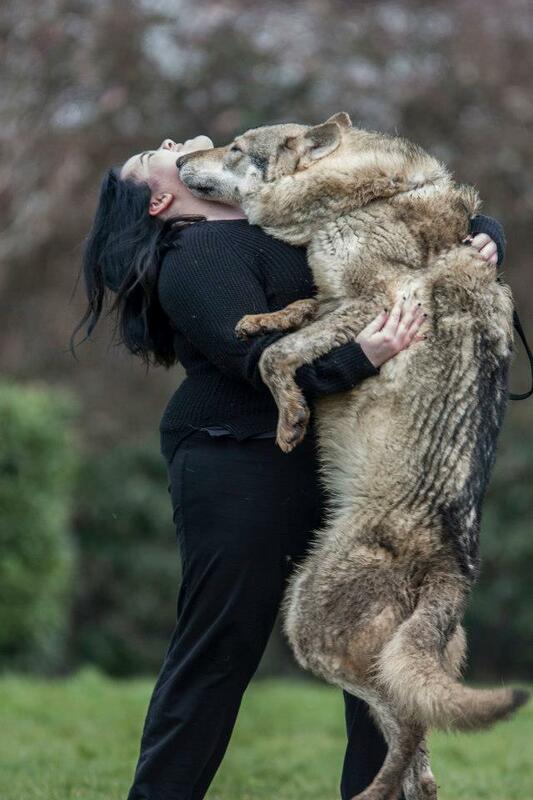 He’s a massive beast, as you can see…but I loved him…loved everything about him. 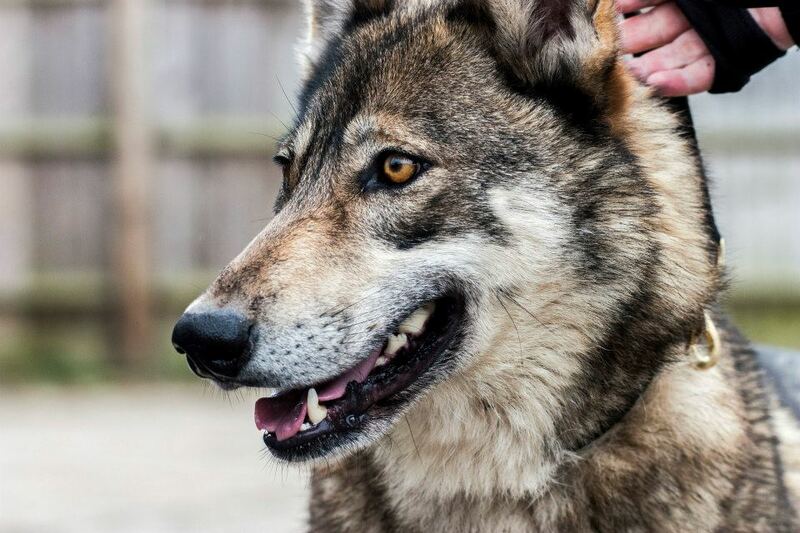 She’s red wolf x, just a little over a year and a VERY skittish girl. I loved her. 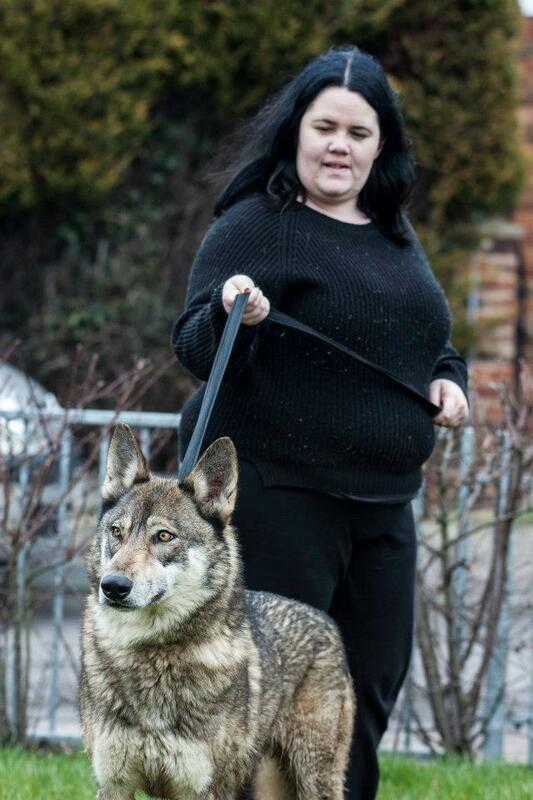 She had the most awesome eyes, and the most odd stalking gait I’ve seen. Her ears are HUGE compared to the rest of her, as seen by the difference in size between her and Rain against me. 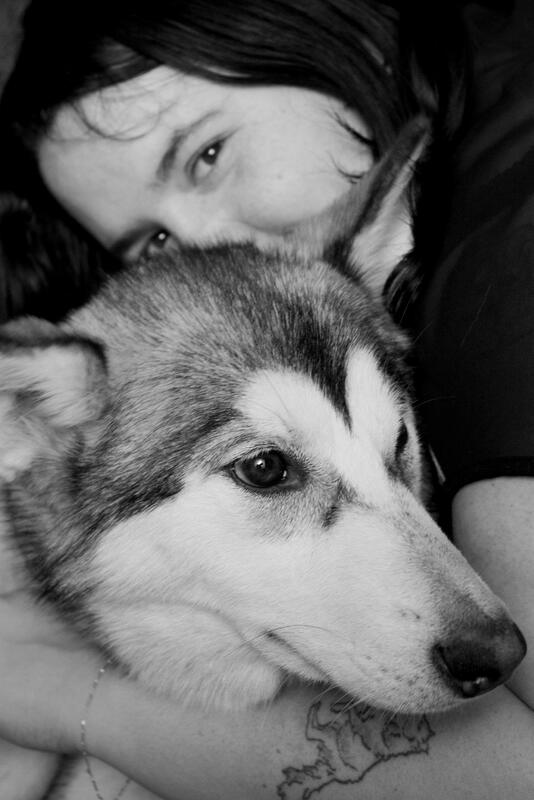 This is a close-up on Miska’s eyes – can see the difference in her head structure/facial shape to Rain. She’s glorious! And finally…I met Soli. 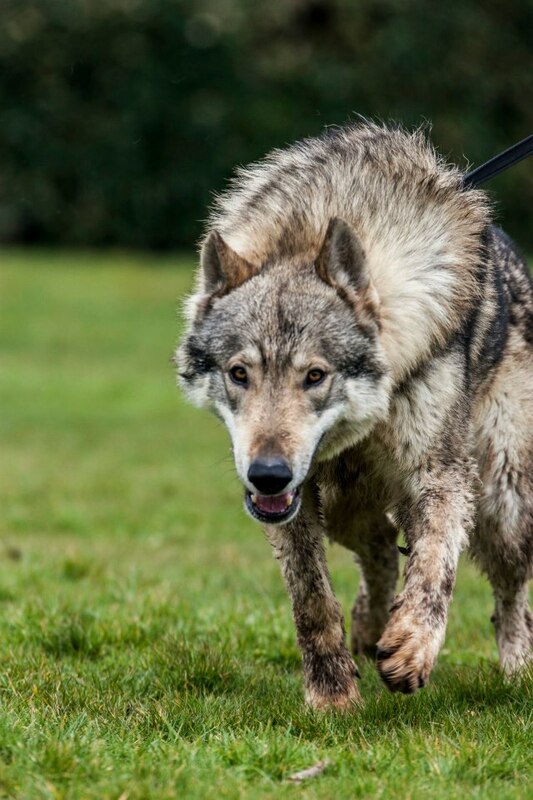 Soli was the oldest wolf-dog, at 9 years old, and his hips are starting to go. He’s sweet, too! A little age-tattered but that is only the fact that he is poorly bred. He was just as lovely as Rain! These wonderful creatures, and many others, are looked after by Artisan Rarebreeds – truly a rescuing gem in the UK. I’d recommend anyone who can afford to to donate money/items/buy stuff off of his wishlist! I want to thank Wayne, who runs the rescue for today. Being able to meet them all is absolutely amazing! I’ve never, ever been as happy as I am today. 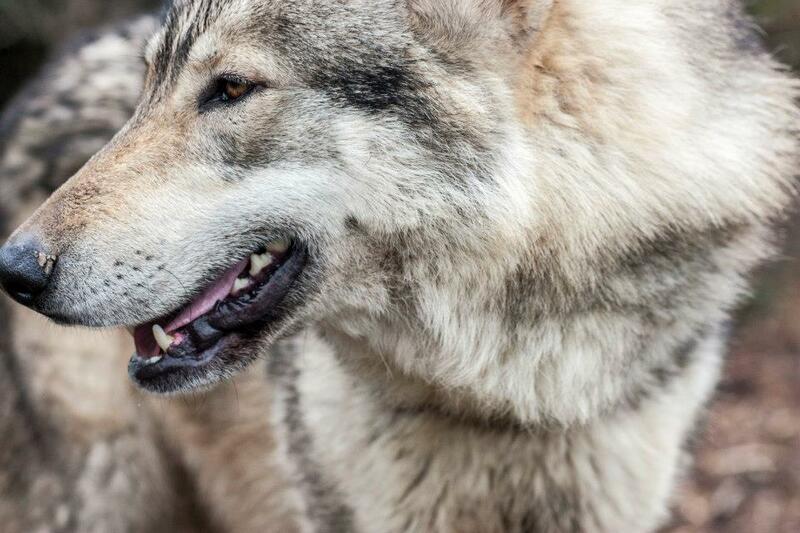 It’s given me a reason for the writing I do, and an idea of someone to thank, and something to add into every book I write with my wolves in – that wolves are to be treasured, and places like Artisan, who take in waifs and strays, are in need of publicity to make sure they get what they truly deserve! …I’m back in another contest that requires me to bare my throat in submission to those who can help me through to the next round. This time it’s the opening chapter for Echoes of Winter that is up for dissection – and I need your help! This gives you a chance to have a sneak peek of the book before you buy it, the chapter offered in its entirety. 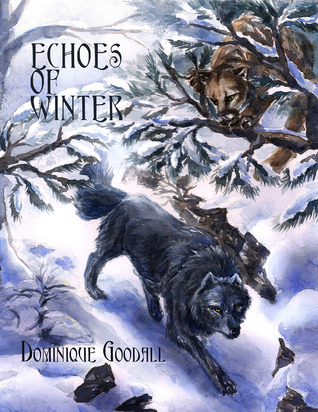 If you use pinterest and love the opening for a book about wolves…then repin it! Share this on Facebook. Tweet it. Help a new author out! I found myself in 1st place! I stayed there for ONE DAY before dropping to 2nd and today I dropped to 5th. I need your help to boost me back up the ranks and through round 2! How can you help, I hear you scream? (In my mind and prayers, at least!) Well you can help with a vote on the site, a like on facebook, a tweet (if you use twitter), a share on LinkedIn (again, if you use it!) and most importantly of all, an honest review and rating! This is the most important part of this for me, it honestly is! Here’s one review and a five star one at that!